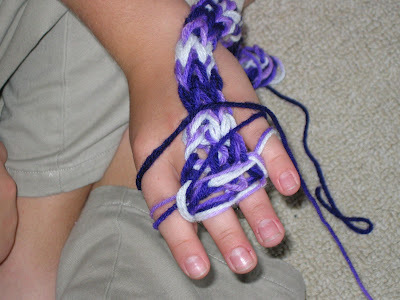 As I was feverishly knitting away on one of my projects while visiting my brother and his family, my nephew informed me that he knew how to "finger knit". I was clueless as to what he was talking about, so he set out to find his previous work, which turned out to be a monster i-cord long enough to go around the "circle" from the dining to living room about two and a half times. Must have been over 30 feel long. 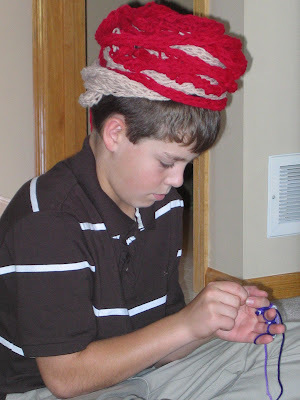 And no, that's not some exotic turban he's wearing, but rather his finger knitting coiled up tastefully on his cranium. Next was a finger knitting lesson for Auntie. 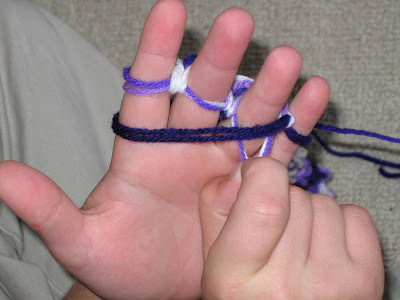 He wraps the yarn around his little fingers, turns his hands over, and pulls the previous loops over the yarn he just wrapped. Funny thing is, it really is an i-cord. I was able to put my finger right into the center of it. Here's a detail of the "stitch technique"!! And look... waa laa... a giant, variagated purple, good for nothing i-cord. We discussed it, but weren't able to come up with one idea for this knitted creature. Even so, it is VERY cool, don'tcha think?? He said he thought I should teach him how to really knit a little when he comes here for Christmas, but we haven't done that yet. I'll have to remind him! It'd be fun, and he's a sharp little bugger that would catch on right away. It wouldn't be tedious and painstaking like trying to teach some wooden-headed adult. Every time I do that I swear I never will again, but the teacher in me always wins out! On the knitting front, I finished a scarf for my son yesterday, and he's had it around his neck every time he went out today. He loves it, and that makes mom feel happy! I'm not thrilled with the way the pattern turned out--it's ribbed and wants to stay all bunched up. I had it steamed into what I thought was the "perfect" width, but after he had it on for only a few minutes, the ribs pulled back together. If I had my druthers I'd frog the whole 6-1/2 feet and do it over using a different pattern, but he thinks it's very cool, so we'll see. I'll take photos of it so I can post pics. Maybe someone out in blogland will have a good idea! Now I've started another scarf for myself, and I'm likin' the way it looks so far! Did a little online shopping this evening, too. Went over to Amazon and ordered a couple of knitting books. Hard to believe, isn't it? Well, I'd gotten a little Christmas Cash, so I figured, why let it sit around and collect dust. That would just be wrong. I'd seen a book on a friend's blog, and was immediately smitten with knitting book envy. Grace, you're a bad influence on me, but that's okay!! I couldn't help myself... I just had to order Ocean Breezes Knitted Scarves, and then to SAVE money and get free shipping, I NEEDED to order another, so I got the newest One Skein Wonders. Makes sense to me..... You too?? Ya, I know. It's so fun sitting here and typing away. Ever since school started, work and responsibility have gotten in the way of knitting and blogging. I keep thinking there must be a solution (quit my job, perhaps?? ), but so far I haven't figured out what it is. The good news is, I have six more days to enjoy reading blogs, and maybe even do some leisure posting on my own. Woo Hoo!! What a darling young man! I'm rather in awe of his finger knitting and I do hope you have some time together to teach him to knit with sticks. 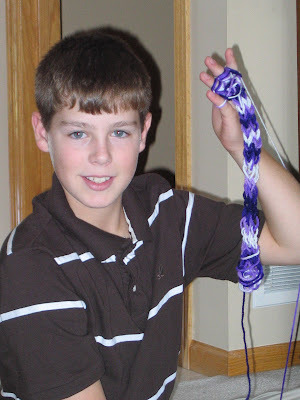 That purple yarn was pretty. Since the Knight announced Sissy's color would be purple (and hunter green, as that's the thread that holds all of us together, from our stable days), I'm growing even more inclined to like the color. I'm glad you're having some down time! How's your mom? I need to get that one skein wonder book too, I have the other, so I need to update with the new one!!! A Big "Thank You" To My SP11 Pal! !